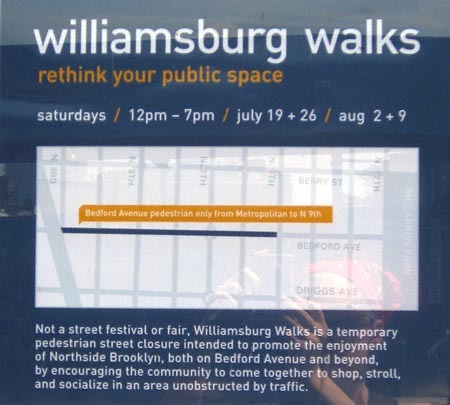 Bedford Avenue will have no vehicular traffic from North 9th Street to Metropolitan Avenue for the next four weekends. Be sure to plan accordingly! When I went to Montreal last month, they had Rue St-Catherine closed off all season for the first time and it was great! It was wonderful to sit outside at a cafe and not choke down passing car exhaust. It’s a great idea for pedestrian heavy areas during the warmer months.